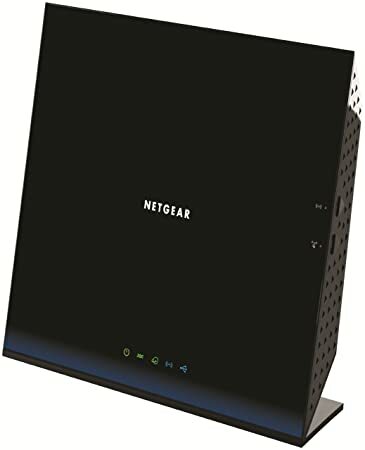 Having used the same Netgear DG834G for more years than I can remember (12+) I wanted something new that could handle the multiplicity of devices that we now connect to the Internet, as the DG834G was struggling. We will, at some time in the near future, be moving from the <2.8mbps broadband over copper wires, to the heady speeds of fibre to the cabinet, and if I know my household, the opportunities for streaming video and audio are likely to cripple the benefit I am looking forward to! This modem offers QoS – Quality of Service – which allows it’s owner (me!) to restrict bandwidth for some services in order not to degrade other services. My OS of choice is Linux, and as all settings are done through a browser, this presented no problems. There is an Android App for Netgear modems, and there are a couple of further tweaks you can do using that, so the lack of an equivalent Linux software product isn’t I feel much of a problem, others have said that they have been able to load the Windows version of Netgear Genie using WINE but it wasn’t working for me. The whole thing set up the basics quickly and easily, I had screen-shot all of the settings from the old DG834G so that I could just copy my preferred tweaks into the new Modem Router. I have used NetGear products both domestically and professionally and they are reliable… unless you get a rare “Monday-morning” device – if you do, go to your supplier (Amazon?) not NetGear, and you should get a replacement pretty quickly. I had done way more research on this modem than probably I needed to, I wanted QoS, I wanted WPS, I wanted the Parental Controls that use and enhance my OpenDNS account and play nicely with my TalkTalk controls too. I wanted to have as much future proofing as I felt was needed, but living in a semi-rural setting I knew I wouldn’t be getting fibre to the house, so I could save myself some cash, not going for NetGear’s top of the range Nighthawk or even the D6300. What I’m disappointed by is minor, but it wouldn’t be a full review if I didn’t mention it, and that is that I can’t get the Guest WiFi system to work. This is possibly because I lock down the internal devices by MAC address, and wanted to give external devices open access through the guest system without MAC addresses – this appears to be unavailable… so if anyone has any guidance on how to do this I’d be interested.